Tablinum: TCM torna a indagare le declinazioni dell’arte attraverso #LeCinqueAnimedellaSculturaIVaEdizione. Da Sabato 25 Novembre a Venerdì 8 Dicembre 2017, presso lo spazio espositivo officinacento5, v.le Lecco 105, Como. L’Inaugurazione della mostra si terrà Sabato 25 Novembre 2017, dalle ore 19.30. Il concetto curatoriale da cui scaturisce tale rassegna è legato alla simbologia artistico – estetica del numero cinque: simbolo di una mente polimorfa, in costante mutamento, che ci spinge ad utilizzare ogni nostra competenza esteriore e interiore per raggiungere un’ aliquid. Una simbologia intensa che permea tutto il percorso espositivo: armonia e contrasto, ricerca e sublimazione, si fondono in questo percorso espositivo ed emozionale che si concretizza in cinque diverse anime d’artista. La scultura riunisce in sé il concreto tentativo di plasmare il mondo che ci circonda e allo stesso tempo di infondere ad esso le suggestioni che s’imprimono con maggiore forza nell’animo umano. Un’interpretazione in cui l’artista si trasforma in medium privilegiato. Per questo ci siamo riproposti di riunire cinque scultori e cinque modi diversi di tradurre nel linguaggio estetico il mondo che ci circonda, attraverso un’acuta analisi dei propri sensi e una declinazione fatta di suggestioni che si concretizzino nelle opere realizzate da cinque diverse anime d’artista. La mostra è a cura della storica dell’arte Elisa Larese. Tablinum: eccovi il video della serata letteraria “Le Ateniesi”, ospite lo storico Alessandro Barbero. Moderatore della serata il classicista Alessandro Cerioli. La serata si è tenuta presso l’Hotel Metropole Suisse di Como, venerdì 17 marzo 2017. Tablinum: la rassegna Lust for Art 2016 ritorna a Como, tornando a indagare le declinazioni dell’arte attraverso “Le Cinque Anime della Scultura. 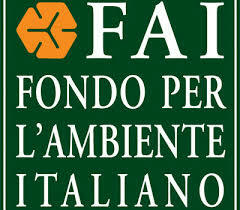 IIIa Edizione” . Quest’anno esporranno le loro ultime opere gli artisti: Roberto Piaia, Pablo Atchugarry, Alexandra Slava Sevostianova, Cecilia Martin Birsa e Teresa Condito. In queste interviste gli artisti partecipanti si raccontano alla storica dell’arte Elisa Larese. Il numero cinque è simbolo di una mente polimorfa, in costante mutamento, che ci spinge a utilizzare ogni nostra competenza esteriore e interiore per raggiungere un’aliquid. Una simbologia intensa che permea tutto il percorso espositivo: armonia e contrasto, ricerca e sublimazione si fondono in questo percorso espositivo ed emozionale che si concretizza in cinque diverse anime d’artista. La mostra è a cura della storica dell’arte Elisa Larese e del classicista Alessandro Cerioli. Tablinum: eccovi alcuni scatti del Vernissage della mostra “Le Cinque Anime della Scultura. IIIa Edizione“, presso lo spazio espositivo officinacento5, a Como. Lo staff di Tablinum Cultural Management ringrazia tutte le persone che hanno partecipato a questa mostra internazionale. How many declinations does art know? Among all possible nuances employed by an artist in order to shape his vision of the world, we have tried to analyse the ways by which the perceptions of the five sculptors unfold. Five artists: by no means a random number. It is a highly symbolic and evocative number which, since ancient times, is associated with experimenting, with the concrete knowledge of facts, with transformation, with the “changing aspects” of a situation. The ancient Greeks associated this number with Hermes, the messenger of the Gods, the connection between sky and earth. Five are also the human senses which serve as a compass to the human being through his life: from an emotional, mental and physical point of view to an ever-changing condition. Number five is the symbol for a polymorphic mind, which is constantly devoted to intelligence and curiosity and has the tendency to reach extreme limits and transgressive boundaries, sometimes in dangerous ways. Number five is associated with the fifth letter of the Hebrew alphabet: “Hey” (ה) which means intuition and illumination. The Kabbalists identify three stages in the letter “Hey”, based on three different, subsequent levels, regarding the development of human awareness throughout one’s life. The mystery of birth and the complete unawareness in which the human being is “flung” into this world, are overcome by the enthusiastic discovery of the beauty and richness existing in the world around us. We thus succeed in understanding that mysterious power within our lives which drives us beyond existing reality. We should not forget that this number withholds the power of self-expression. In fact, the physical components corresponding to our ability to speak are exactly five: tongue, teeth, palate, lips and throat. Indeed, the complex interaction between the intellect and word is precisely what allows the number five to indicate the usage of every kind of inner and external discipline in order to shift our personality from a state of uneasiness and a search for an “aliquid” to a desired condition. Only by mastering communication, the formulation of ideas and feelings together with the expression of facts, can a balanced exchange and personal development be achieved. Such intense symbology is to be found in the various forms of the works presented by these five sculptors. Harmony and contrast, research and sublimation merge in their works. Sculpture represents the concrete attempt to shape the world around us and, at the same time, to infuse it with perceptions, which impress the human soul in the most powerful way. By offering their personal interpretation and their acute analysis of their own senses, each of the five artists is transformed into a “privileged medium”. Alexandra Slava Sevostianova, is the youngest of the artists selected for this third edition. Hers is a career of promising success: at the age of only twenty, She has already achieved important acknowledgements among which that of the Art Renewal Center and her works have already been on display in private collections in Ukraine, Malta, France and Italy. She will exhibit four works at The Five Souls of Culture in which, in accordance with anatomical rigour, reflecting a classical perfection, the artist’s strong sensitivity is based, and who knows how to look beyond the circumstances by gliding on the wings of her own emotions. Her sculptures manifest themselves by the struggle in which the artist engages in favour of beauty and truth countering the triviality of everyday life. Precisely this desire to free herself from shameful daily things in the name of a greater ideal is the primary inspiration of “Call for Angels” a sculpture which is a programmatic manifestation of the emotions which thrust the artist towards the creative act. “My Ukraine” is a tribute to her native country, held tight in the in the coils of serpents which have not managed to bend its strength and which is ready to resurrect even more beautiful than before. “The Unbearable Lightness” expresses all the unsustainable irresponsibility in many amorous relationships, experienced in the ups and downs of daily life, but does not want abandon the desire to sublime oneself in an eternal and incorruptible feeling. “Take My Pain Away” is a self-portrait in which the artist does not hesitate to expose herself to the spectator, in all its own inner fragility. Cecilia Martin Birsa says she cannot live with art – “without it I could only survive”. 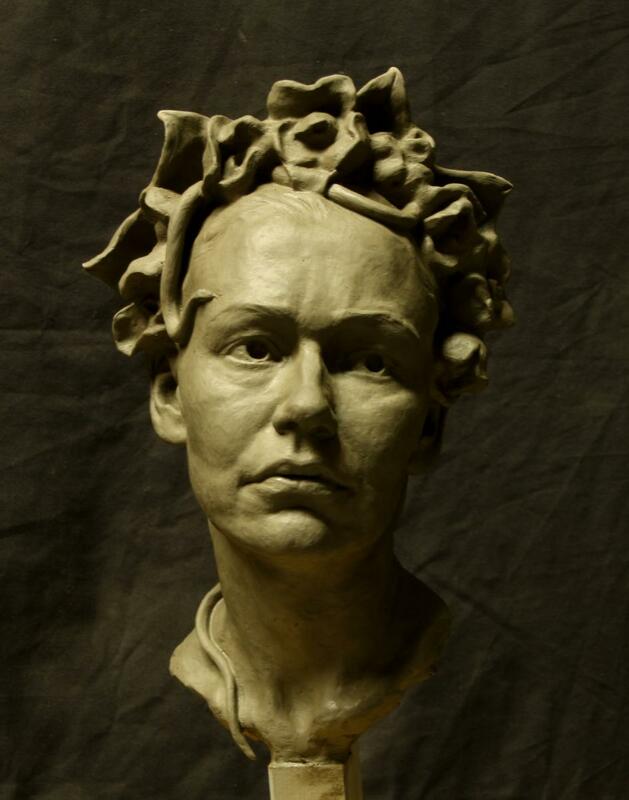 It is precisely this unrenounceable urgency, such as breathing, which emerges in her sculptures. They are realized with an unusual medium which surprises us for its simplicity and its form that the sculptress manages with great effort to create: The stone of rivers with all its atavic unpredictability which “speaks of magma, abysses, ice and earth”. Medium such as mucronite, granite or serpentine require a real act of maieutics in order to free those forms which await in a state of drowsiness, which endured hundreds, perhaps thousands of years to reawaken. 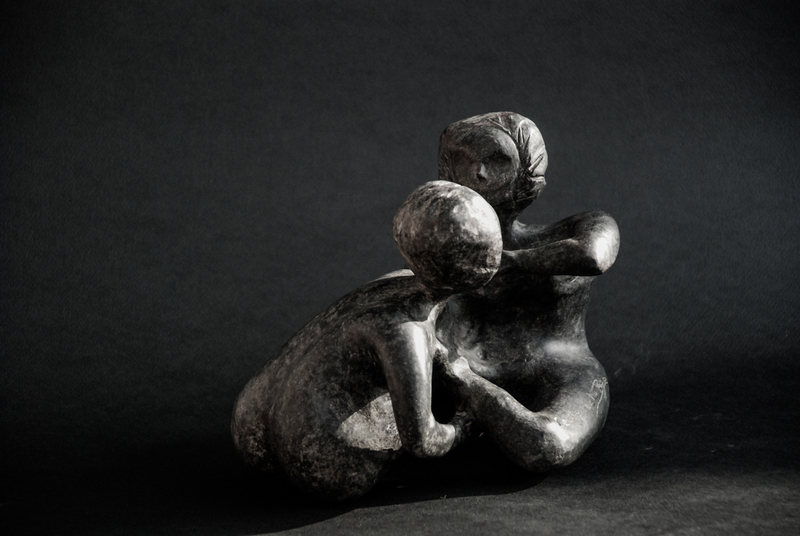 Cecilia Martin Birsa will propose three of her works at The Five Souls of Sculpture which were hailed as a great success on the occasion of her latest personal exhibition in Venice at the Rosenberg Gallery, which coincided with the 5Th. 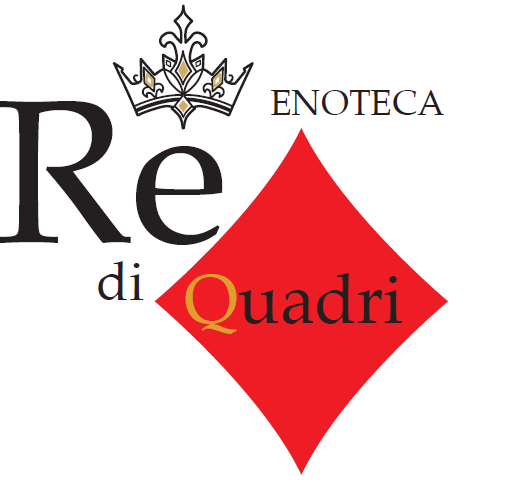 centenary of the Venetian Jewish Ghetto: “Arcuata”, “Donna allo Specchio” and “Nodo Nero”. 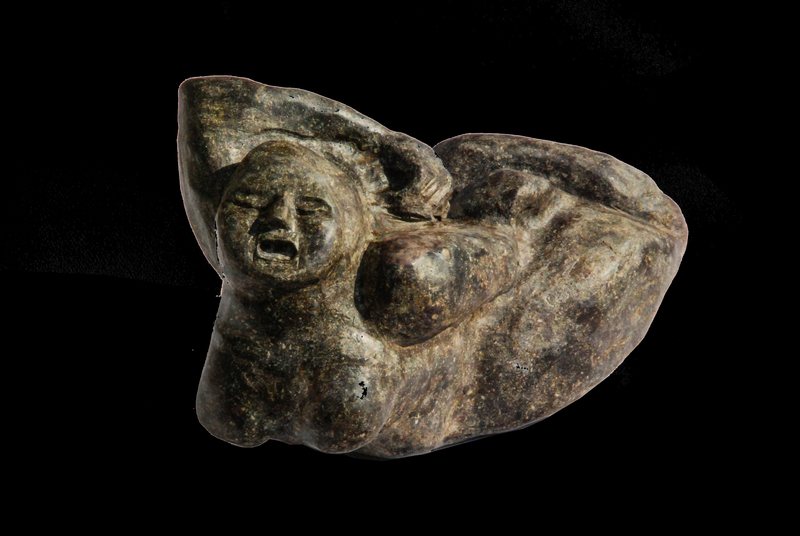 In these sculptures, the artist manages to liberate from stone forms of atavic sensuality of her own female universe, which reveals itself to be solidly bound to that arcane and inexhaustible mystery that is life and which is reached through everything that revolves around it. Her artistic development may be witnessed in her creation of sculptural volumes in a more efficient and expressive communicative form. 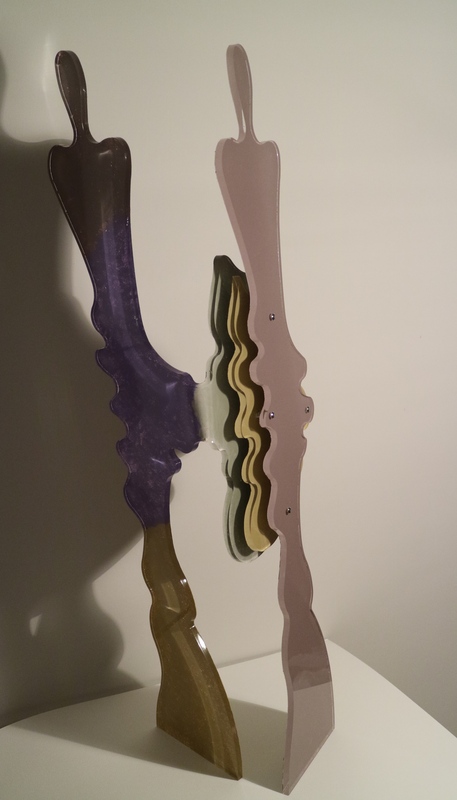 The works on exhibit at The Five Souls of Sculpture eloquently express a phase of strong artistic inspiration from whose emotions new creative solutions emerge. Thus works like “Black and White”, “Thrill” and “Metamorphosis” are born. 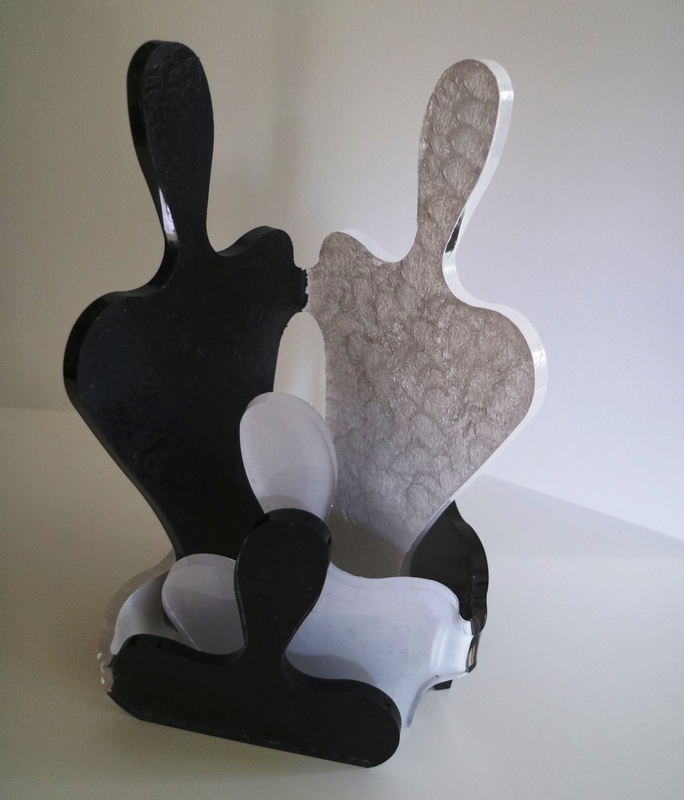 They are small sculptures formed in plexiglass in which the transparency of the material integrates with desired abstract forms and colours which contrast with each other, as it is possible to admire the two faces of the sculpture in an emotional short circuit which reflects the artist’s strong artistic emotionality as well as the continuous state of metamorphosis in which she exerts her own sensitivity by means of the creative process. 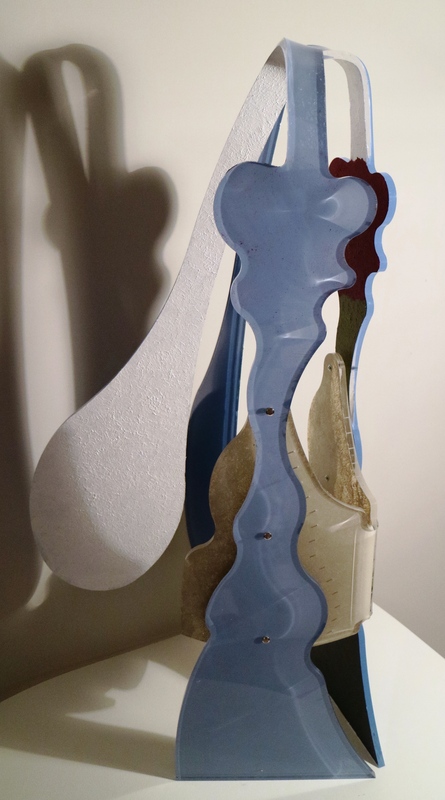 Roberto Piaia has always represented the female soul infusing in his pictorial and sculptural works The teachings of strongly innovative techniques by the ancient masters, fruit of his studies and constant experimentation, which make him an authentic pioneer. Mr Piaia, creator of the Assurfivo pictorial technique, officially entered the Aristocracy of Italy’s finest artists in 2009, having been awarded the AIC (High Critical Interest) classification by the Modern Art Catalogue Critical Committee which is edited by Mondadori. He exhibited at the 54th. Biennale of Venice – Italian pavilion in 2011 and officially presented his first Carrara marble statue “Iris” together with an oil painting entitled “Darya in Cladico”. His research has brought about a re-elaboration in the sculptural sector of an artistic Ideology in which the classical unites with dynamicity. 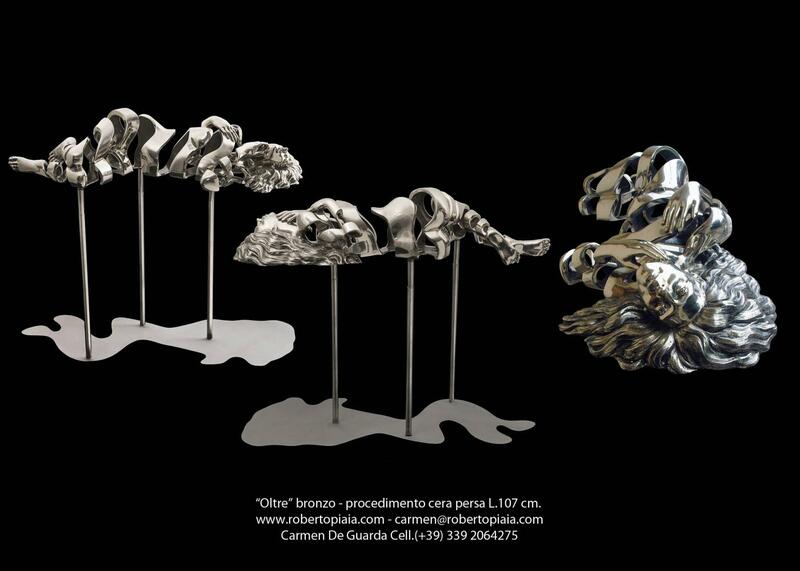 His sculptures therefore represent, at the same time, both pictorial and sculptural elements. 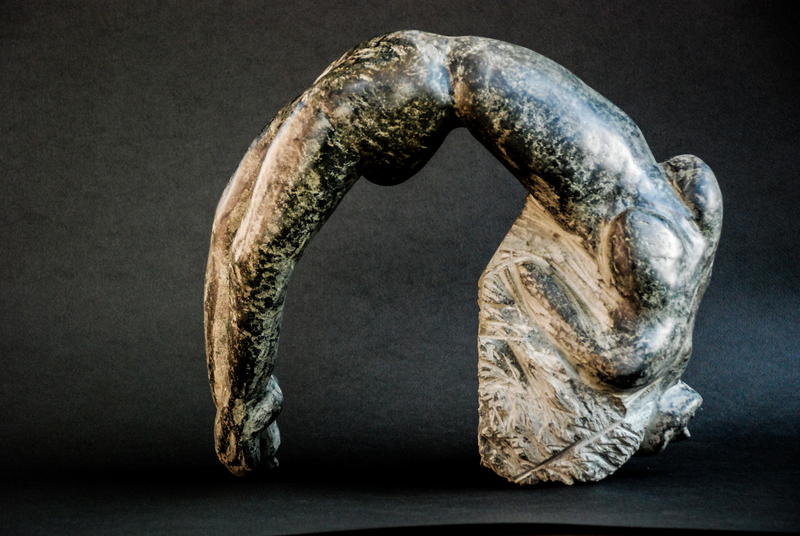 His sculptural creations are realized by employing statutory marble or a bronze fusion. While maintaining the female figure as the subject of his inspiration, the body mass is composed of a double propeller which rotates around itself, thus creating a spiral. 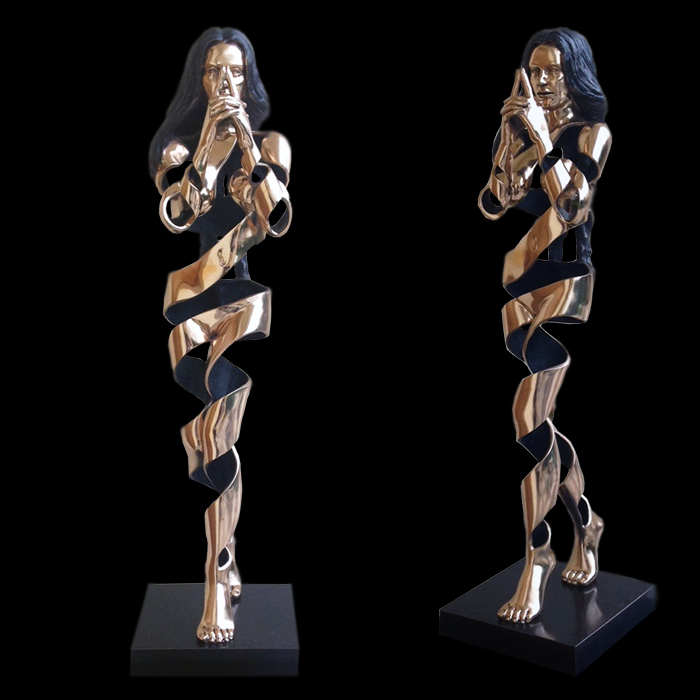 Mr. Piaia will present at the Five Souls of Sculpture his works “Mudra” and “Oltre in Bronzo” one in bronze and the other in an alloy of bronze and steel, the result of personal studies and experimentations. In “Mudra”, Mr Piaia transposes on the sculptural level his own Assurfivo concepts which fuse inseparably representations which we only discover are apparently incompatible: the figurative realism of face and hands separate themselves from the classical academic composure into the spiraling volume of the body, in which the forms recall typically surrealistic concepts dominated by mystery and fantasy. Pablo Atchugarry divides his time between Uruguay, his native country, and Italy where he has been living since 1978. Since the beginning of his career he has dedicated his artistic sculptural research by expressing his own poetic talent by means of various materials: he first worked with cement, wood and metals until he later used Carrara statuary marble with which he has created his famous monumental sculptures. 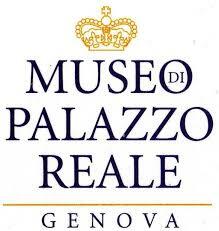 Once he moved to Lecco (Italy) in 1978, he began experimenting and creating monumental sculptures in Carrara marble. His first tribute could not be other than to Michelangelo Buonarroti with two works: “La Lumiere” and “La Pietate”. He, already an artistic icon in Uruguay,created the sculpted group “Soñando la Paz” on the occasion of the 50th Exhibition La Biennale in Venice. In 2015 he presented 40 of his works at a personal “Pablo Atchugarry – Città Eterna, Eterni Marmi” exhibition at the Fori Imperiali Museum in Rome. He also created a sculpture engraved in olive wood, which was more than 800 years old, for the Uruguayan pavilion at Expo 2015, entitled “La vida después de la vida”. On the occasion of The Five Souls of Sculpture exhibition, he will present his latest creation “Senza Titolo” in Carrara statuary marble. 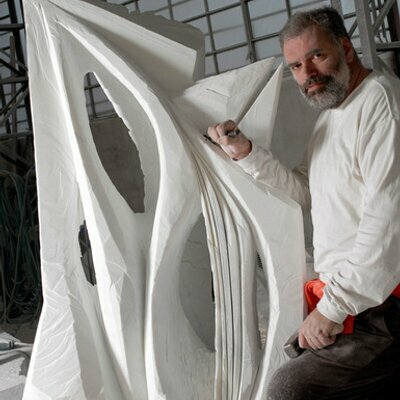 Pablo Atchugarry’s chisel touch transforms marble in such a way that it seems to open up into candid folds, which change and are at the same time crystallized, thus indicating the apparent slow passage of Art, so typical of immortal creations. Essential and pure forms are the language of this work which, void of a title decided by the artist, leaves the spectator free to interpret it within a range between signifier and signified. Tablinum: quante declinazioni può conoscere l’arte? Tra le infinite sfumature con cui l’artista plasma la propria visione del mondo abbiamo cercato d’indagare le vie per cui si snodano le suggestioni di cinque scultori. Cinque. Un numero non certo casuale. Un numero simbolicamente evocativo che fin dai tempi antichi è associato all’atto di sperimentare, alla conoscenza concreta dei fatti, del cambiamento, del “mutamento di stato” di una situazione. Gli antichi greci lo riconducevano a Hermes, messaggero degli dei, tramite tra cielo e terra. Cinque sono anche i sensi che fanno da bussola per l’essere umano nella sua esistenza: da un punto di vista emotivo, mentale e fisico, ad una condizione sempre nuova. Il numero cinque è simbolo di una mente polimorfa, costantemente votata all’intelligenza e alla curiosità, porta con sé la tendenza ad avvicinarsi, a volte anche in modo pericoloso, a linee di confine, di trasgressione. Il Numero Cinque è legato alla quinta lettera dell’alfabeto ebraico : Hey ( ה ), che significa intuizione, illuminazione. I cabalisti, individuano tre stadi per la lettera Hey, i quali si pongono su tre livelli diversi, successivi, in merito allo sviluppo della consapevolezza dell’essere umano nell’arco di tutta la propria esistenza. Il mistero della nascita, la totale inconsapevolezza con cui l’essere umano è “gettato” in questo mondo, viene qui superata dall’entusiasmo nello scoprire quanto di bello e fertile è presente nel mondo che lo circonda. Arriviamo, qui, a intuire quella misteriosa potenza all’interno della nostra esistenza che ci sospinge al di là della contingenza. Ma non dimentichiamo che questo numero conserva in sé la forza dell’autoespressione. E Infatti, le componenti fisiche corrispondenti alla capacità di parlare, sono esattamente cinque: lingua, denti, palato, labbra e gola. Proprio per la complessa interazione tra intelletto e parola, il cinque suggerisce di utilizzare ogni tipo di disciplina interiore ed esteriore, al fine di “traghettare” la nostra personalità, da uno stato di disagio, di ricerca di un aliquid, allo stato desiderato. Solo governando bene la comunicazione, l’espressione di idee, sentimenti e fatti, è possibile giungere a uno scambio equilibrato e quindi crescere. Una simbologia tanto intensa che trova le sue diverse impressioni nelle opere di questi cinque scultori. Armonia e contrasto, ricerca e sublimazione si fondono nelle loro opere. La scultura riunisce in sé il concreto tentativo di plasmare il mondo che ci circonda e allo stesso tempo di infondere ad esso le suggestioni che s’imprimono con maggiore forza nell’animo umano. Un’interpretazione di cui l’artista si trasforma in un medium privilegiato. La terza edizione de Le cinque anime della scultura, presso officinacento5 si rivela un tentativo di plasmare il mondo che ci circonda grazie a un’ acuta analisi dei propri sensi e una declinazione fatta di suggestioni che si concretizza in cinque diverse anime d’artista. Alexandra Slava Sevostianova, artista dalle origini ucraine, è anagraficamente la più giovane tra gli artisti selezionati per questa terza edizione. La sua è una carriera di promettenti successi: a soli vent’anni, Alexandra Slava Sevostianova ha già riscosso importanti riconoscimenti tra cui quello di The Art Renewal Center e le sue opere sono già parte di importanti collezioni private in Ucraina, Malta, Francia e in Italia. In occasione delle Cinque Anime della Scultura, esporrà quattro opere, plasmate in argilla, in cui al rigore anatomico, riecheggiante una classica perfezione, si fonde la forte sensibilità di un’artista che sa guardare oltre la contingenza librandosi sulle ali delle proprie emozioni. Le sue sculture si fanno manifesto della lotta che lo scultore ingaggia in favore di bellezza e verità contro la trivialità della vita di tutti giorni. Proprio la volontà di librarsi al di sopra delle brutture della quotidianità in nome di un più alto ideale è l’ispirazione primaria di “Call for Angels” una scultura che si fa manifesto programmatico delle emozioni che spingono l’artista all’atto creativo. “My Ukraine” è un tributo alla propria patria d’origine stretta nelle spire di serpenti che non sono riusciti a piegarne la forza e pronta a risorgere più bella che mai. “The Unbearable Lightness” esprime tutta l’insostenibile leggerezza di un rapporto amoroso come tanti, vissuto fra gli alti e i bassi della quotidianità, ma che non abbandona la propria aspirazione a sublimarsi in un sentimento eterno e incorruttibile. “Take My Pain Away” è un autoritratto in cui l’artista non esita ad esporsi all’occhio dello spettatore in tutta la propria fragilità interiore. Cecilia Martin Birsa dichiara di non poter vivere che d’Arte: “senza potrei solo sopravvivere”. Ed è proprio questa urgenza irrinunciabile, quanto il respirare, che emerge nelle sue sculture. Esse sono realizzate con un medium inusuale che ci stupisce per la sua semplicità e per le forme che la scultrice riesce, non senza fatica, a liberare da esso: la pietra di fiume con tutta la sua atavica imprevedibilità che “parla di magma, abissi, ghiaccio e terra”. Medium come la mucronite, il granito o il serpentino richiedono un vero e proprio atto di maieutica per liberare quelle forme che attendono in un dormiveglia, durato secoli, forse anche millenni, di essere risvegliate. In occasione de Le Cinque Anime della Scultura, Cecilia Martin Birsa riproporrà tre opere accolte con grande successo in occasione della sua ultima personale a Venezia presso la Galleria Melori&Rosenberg in concomitanza del cinquecentenario del Ghetto Ebraico di Venezia: “Arcuata”, “Donna allo Specchio” e “Nodo Nero”. In queste sculture, l’artista libera dalla pietra forme dalla sensualità atavica propria dell’universo femminile che si rivela saldamente legato a quel mistero arcano e inesauribile che è la vita e che giunge attraverso tutto ciò che ruota attorno a esso. Teresa Condito è stata membro del Collettivo la Grand Bouffe presso la 56° Biennale di Venezia, dove ha ricevuto il premio ufficiale dallo stato del Guatemala e dal Commissario del Padiglione Nazionale. Torna ad esporre con Tablinum a seguito di Ars Naturans, svoltasi in agosto presso il Museo Giardino Botanico di Villa Carlotta. Il suo sviluppo artistico vede nella creazione di volumi scultorei la sua forma comunicativa più efficace ed espressiva. I materiali prescelti spaziano dal marmo al corten passando per l’alluminio, l’acciaio, il plexiglass e le pietre preziose. Le opere esposte in occasione de Le Cinque Anime della Scultura esprimono eloquentemente una fase di forte ispirazione artistica in cui le emozioni fanno scaturire nuove soluzioni creative. Nascono così opere come “Black and White”, “Thrill” e “Metamorphosis”. Si tratta di sculture in plexiglass di piccolo formato in cui alla trasparenza di questo materiale si legano forme volutamente astratte e colori contrastanti fra loro, così come le due facce da cui è possibile ammirare la scultura in un corto circuito emozionale che restituisce la forte emotività dell’artista e lo stato di continua metamorfosi in cui esercita la propria particolare sensibilità mediante il processo creativo. Roberto Piaia ha da sempre rappresentato l’animo femminile fondendo nelle sue opere, pittoriche e scultoree, l’insegnamento degli antichi maestri a tecniche fortemente innovative, frutto di studio e sperimentazione costanti che lo rendono un vero e proprio pioniere. Ideatore della tecnica pittorica dell’Assurfivo, Piaia nel 2009 entra ufficialmente nel Gotha dei migliori pittori d’Italia, avendo ricevuto dal Comitato Critico del Catalogo d’Arte Moderna, edito da Mondadori, la classificazione di AIC, cioè Alto Interesse Critico. Nel 2011 espone alla 54 Biennale di Venezia padiglione Italia e presenta ufficialmente la sua prima statua di marmo di Carrara “Iris” e un dipinto a olio dal titolo “Darya in Cladico”. In ambito scultoreo la sua ricerca lo ha portato a rielaborare un’ ideologia artistica in cui il classico si congiunge alla dinamicità. Per questo le sue sculture si fanno fusione di valori al contempo pittorici e scultorei. Le sue creazioni scultoree sono realizzate utilizzando il marmo statuario o la fusione di bronzo. In esse pur mantenendo come soggetto d’ispirazione la figura femminile, i volumi del corpo sono costituiti da una doppia elica che si avvita su se stessa creando una spirale. 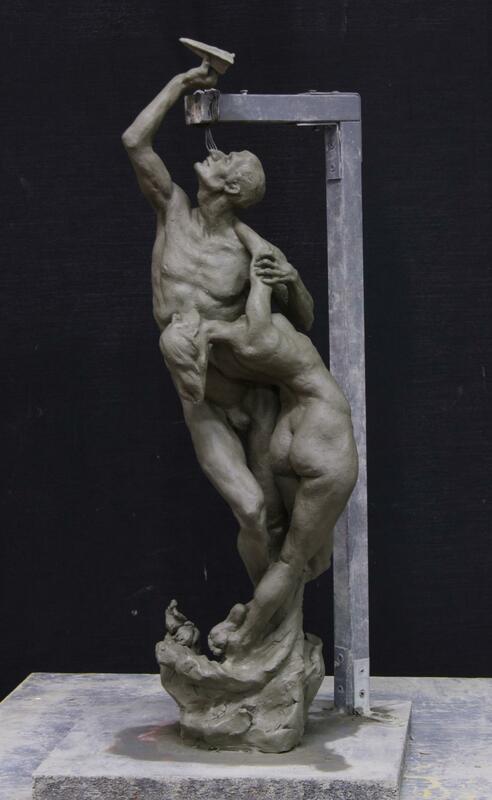 Piaia presenterà durante Le Cinque Anime della Scultura “Mudra” e “Oltre in Bronzo” realizzate una in bronzo, l’altra con una particolare lega in bronzo e acciaio frutto di studi e sperimentazioni personali. In Mudra, Piaia traspone sul piano scultoreo i concetti propri dell’Assurfivo che fondono inscindibilmente rappresentazioni che scopriamo solo in apparenza inconciliabili: il realismo figurativo di volto e mani astrae la propria compostezza dal sapore accademico nel volume spiraleggiante del corpo, dove le forme richiamano concetti tipicamente surrealisti dominati dall’arcano e dalla fantasia. In “Oltre in Bronzo” il concetto di leggerezza e scomposizione materica è richiamato dalla scomposizione del corpo femminile in una doppia elica in cui l’esecuzione rasenta l’utopia in “uno studio machiavellico di pieni e vuoti”. Pablo Atchugarry si divide fra l’Uruguay, sua patria d’origine, e l’Italia, a Lecco, dove vive dal 1978. Sin dagli albori della propria carriera ha dedicato la propria ricerca artistica alla scultura esprimendo attraverso vari materiali la propria poetica, componendo con cemento, legno e metalli fino ad approdare al marmo statuario di carrara con il quale ha realizzato le sue celebri sculture monumentali. Giunto in Italia, a Lecco, nel 1978, ha intrapreso la sperimentazione e la creazione di sculture monumentali in marmo di carrara. Il suo primo tributo non può che essere a Michelangelo Buonarroti con due opere “ La lumiere” e “ la Pietate”. Diventato ormai un’ icona artistica dell’ Uruguay, ha realizzato in occasione della 50ª Biennale di Venezia il gruppo scultoreo “Soñando la Paz”. 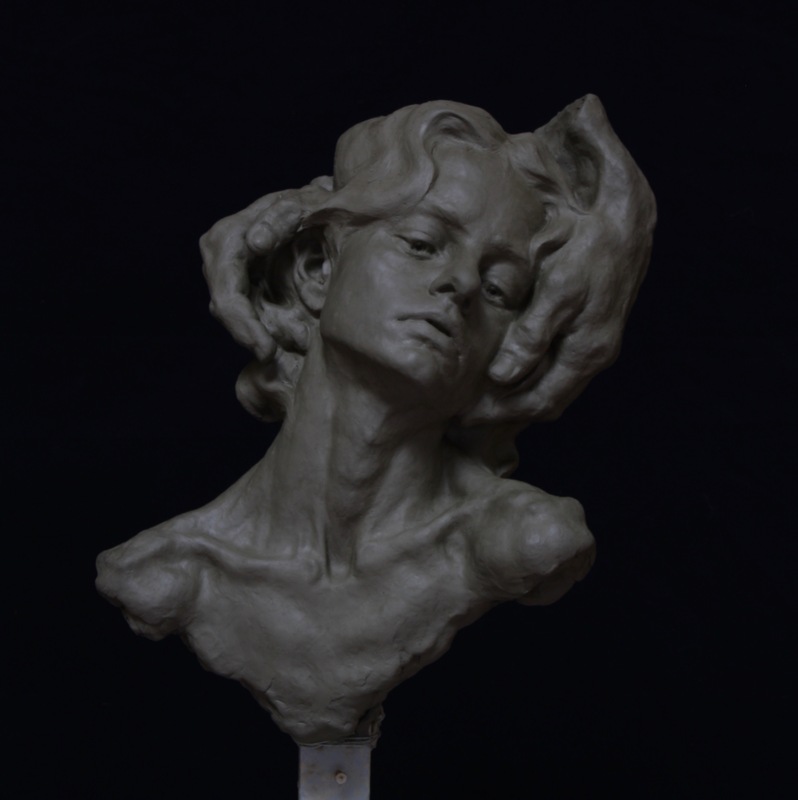 L’artista presenterà in occasione de Le Cinque Anime della Scultura la sua ultima creazione, “Senza Titolo”, da poco terminata, in marmo statuario di Carrara. Il marmo sembra schiudersi al tocco dello scalpello di Pablo Atchugarry in candide pieghe che mutano e al contempo si cristallizzano scandendo il tempo dell’Arte che scorre con l’apparente lentezza delle creazioni immortali. Essenzialità e purezza delle forme sono il linguaggio di quest’opera che ci si presenta senza un titolo stabilito dall’artista e lascia libera l’interpretazione dello spettatore di spaziare fra significante e significato.